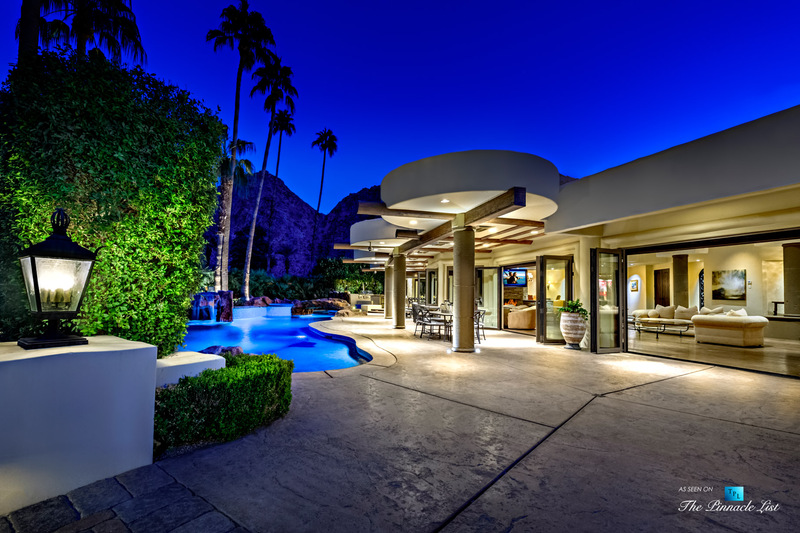 No expense has been spared inside this impressive technologically savvy smart Indian Wells contemporary Mediterranean fusion luxury home. Featuring a great room with fireplace and sit down bar, formal dining room, wine cellar, and gourmet kitchen with morning room, beautiful lounge with billiard room, sports bar and family room. Relax at your own 5-star luxury pool with waterfalls, a grotto, swim up bar, separate spa, and top of the line outdoor barbeque. Extensive exterior patios include multiple dining areas, fireplace, and media. Featured in the residence are two separate master suites with private jacuzzi tubs and saunas. Three additional bedrooms include private baths. Marble and stone throughout with recessed lighting and incredible fixtures with a stunning Moroccan themed family room adjacent to cozy media room and billiards area. Enjoy an exercise room with equipment and a 500 bottle temperature controlled wine cellar as well as a separate office/study. Furnishings are negotiable.